Who is your favorite teacher? We are honoring all teachers with this great back to school giveaway. Reviewz & Newz has agreed to help our friends at Tom's Take on Things by promoting this giveaway. Growing up I think we all must have had a favorite teacher of ours. That one teacher who inspired us the most and taught us to not limit our potential and reach our goals. Tom over at Tom's Take On Things remembers his favorite teacher. Her name was Mrs. Krnac, his 5th-grade teacher from Willow Elementary School in Cleveland, Ohio. Tom attributes her to teaching him that nothing was impossible and that a dream could come true if you work hard enough at it. 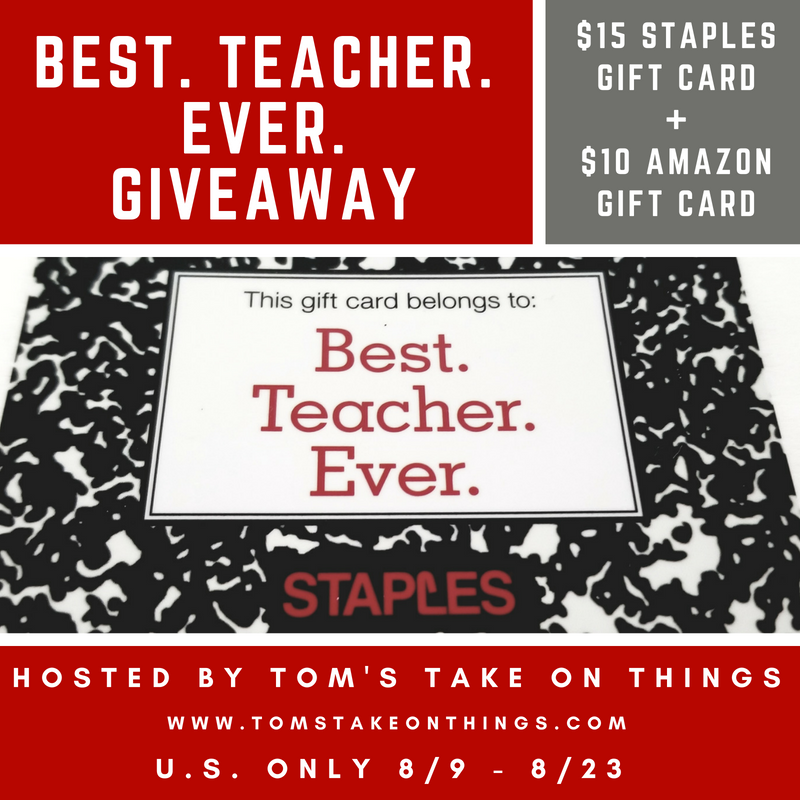 Thinking about teachers from the past, and those who are teaching today, Tom wanted to do a giveaway that honors them for the sacrifices, dedication, and devotion they gave us and the students that are being taught today. Insert Story about your favorite teacher here. One winner will receive both a $15 Staples Gift Card and a $10 Amazon Gift Card if you win this giveaway. You can keep it for yourself, shop for your kids, or maybe even donate it to a teacher who might need it. Giveaway is open to the U.S. Only and ends on 8/23 at 11:59 pm EST. Winner will have 48 hours to respond to winning email. Participating Bloggers are not responsible for prize delivery. My favorite teacher growing up was Ms. Davis, she was a good teacher. My son's favorite teacher is Ms. Thyfault, she was so patient and sweet.